Last month, while delivering the commencement address to graduating cadets at West Point, President Barack Obama outlined a new era in America’s relationship with the international community. For public administrators and managers within the U.S. foreign policymaking arena, this speech is important because it entails the roots of a monumental shift in mission and scope for key programs and organizations. In his West Point speech, Obama intimated that the federal machinery erected in response to the War on Terrorism, which primarily focused on the Middle East, would now be turning its attention to the growing threats arising out of Africa. In particular, the countries that this new initiative deals with hail from North Africa and the continent’s vast Sahel region. Critics of this new initiative have been quick to highlight areas within the administration’s geopolitical outlook that they believe detracts from America’s larger role in the world. Much of this criticism raises important concerns, namely this new enterprise will set America on a course toward abandoning its commitments to historic partnerships and bilateral relationships, traditional regional balance arrangements, as well as its dedication to international alliances and zeal in upholding common international agreements. What critics fail to highlight however, is what exactly Obama’s West Point address does emphasize in regards to America’s position in the world. As America winds down from its wartime posture, this change in political/military orientation should come as no surprise. Terrorist threats emanating out of Africa have steadily increased over the past decade. In 2007, President Bush created the United States Africa Command (AFRICOM) as a response to these emerging threats and other security challenges. This was the nation’s first military command dedicated to the African continent. It was established to provide military assistance and cooperation with African states as they strive to improve their security, further develop their democracies and provide better governance to their citizens. As the War on Terror winds down in Iraq and Afghanistan, Obama’s strategy for keeping America safe ultimately calls for a re-examination and new assessment of America’s role in the world. Under the previous White House administration, America’s role in the world was dramatically altered after the events that took place on September 11, 2011 (9/11). Now more than a decade later, the world has transitioned from a 9/11 mind frame. However, it is important that America’s perspective continues to keep pace with the world as it presents itself. Perhaps the most conspicuous component of this new outlook is the movement away from the policy of nation-building. In Iraq and Afghanistan, nation-building was seen as necessary because it was the central governments that U.S. and coalition forces felt compelled to forcefully remove from power. Previous administration officials within the Bush White House concluded that both the Taliban (Afghanistan) and the Saddam Hussein regime (Iraq), harbored terrorists and allowed terrorist cells to proliferate and metastasize within their borders. 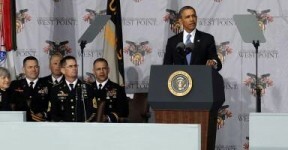 However, Obama and prominent officials within his administration recognized the need for nation-building had subsided. Over these past few years, Iraq and Afghanistan successfully held free and fair elections and made other important strides toward building lasting democracies. Although the political situations within these two countries still face an uphill battle, they no longer pose any substantial threats to the U.S. As the international system continues to reshape itself and grapple with globalization, modern technology and the myriad ways in which to spread extremist ideas, America’s security strategy must undergo certain changes and acknowledge these particular realities in order to effectively and responsibly secure the nation’s continental and oversees interests. The Obama administration is acknowledging the potential dangers that certain weak states on the African continent contain. Obama’s course of action is to bolster and empower America’s existing international alliances, partnerships and strategic allies, as part of an effort to make progress against these security challenges more lasting and realistic. Obama’s new policy recognizes that America alone cannot police the world absolutely nor indefinitely. By working with different nations and equipping them with the requisite tools and capabilities necessary to combat and prevent different levels of radical extremism, Obama’s international strategy is reminiscent of President Truman’s North Atlantic Treaty Organization (NATO). NATO was designed primarily to bolster the security and defense capabilities of certain European countries as a way to prevent and counter Soviet aggression. One reason that NATO has been so successful is America’s considerable role within the organization. Not only does America provide NATO with most of its funding and other essential resources necessary to support a healthy international military alliance, but this benefactor arrangement also allows America to exert a considerable amount of influence over its day-to-day operations, as well as its long-term strategic planning and vision. Obama’s vision to increase the level of cooperation between America and the countries outlined in his speech will allow this, and future White House administrations, to exercise a similar type of influence at a time when America’s leadership is needed most. Congress and relevant executive administrative agencies must also play an important part in crafting the type of legislation and system that will make this venture a lasting success. In his remarks, Obama announced that he will be putting forth to Congress, a proposal for more than $5 billion to implement the administration’s new course in foreign affairs. Congress can utilize this opportunity as a way to fully assess this new course of action and address any potential areas of concern. Congress also has an opportunity to become more knowledgeable and develop a more thorough understanding of the areas in which the White House plans to engage. During their committee deliberations, members of Congress can also acquire a better sense of how a new set of U.S. policies will affect the countries outlined in Obama’s new initiative, as well as their relations with their neighbors within the region, and with the U.S. itself. Members of Congress can invite subject matter experts and other professionals with extensive experience, to give testimony concerning issues relevant to their ability to make sound and informed decisions. By availing itself and effectively utilizing the opportunities, technologies and other resources at its disposal, Congress will be in a better position to manage effectively these affairs alongside the president. In addition, performing these functions will also open a national dialogue with the nation at large, a central component to any healthy democracy. Because the threats articulated in Obama’s West Point address pose no immediate dangers to the mainland United States, let’s hope that the president and Congress take this opportunity to allow the American people to weigh-in and deliberate on these new initiatives as well. History shows that when the American people and their government are united, the results tend to be beneficial for all.